When I got these boots in December, I never in a million years thought they would be such a thing! I thought they were cute and that they would be perfect for my trip to Colorado over New Year’s. However, when I wore them for the first time (to the airport in Chicago to fly out to Denver), I knew something was up. I was pretty impressed with how well they held up for me in the snow in Colorado, and they were warm, too. You never really know with inexpensive shoes! And since I’ve been back in Illinois in January and February, I’ve been wearing them on repeat. With skinny jeans, with dresses and tights, fleece-lined leggings, you name it. You can see some of the outfits in this post and this post! Since I’ve been trying to share more of my day-to-day outfits on Instagram Stories, so the boots have made quite a few appearances. And the DM questions were FLOODING IN! It seemed like I was sharing a “Swipe up!” link to these boots almost every single day and the questions were still coming in. How do they fit? Are they comfortable? Are they warm? How’s the quality? So I did a quick little video on Stories to answer all of the questions! And you guys, omg — there were an insane number of these boots purchased that day. And that’s not counting all of the DMs of people who told me they bought them in-store, and people who bought them outside of the Swipe Up link (in which case I don’t get the small commission* and am unable to “track” those sales). It’s like the Bows & Sequins version of “THE COAT.” *PS: Major side-note — I’m planning on doing a post about this in the coming weeks! A few people have asked about bloggers “getting credit” for a sale, and I think it will be really interesting to shed some light about this in a super transparent way! So stay tuned… Realistically, probably not until March though. Anyway! Back to the questions at hand. 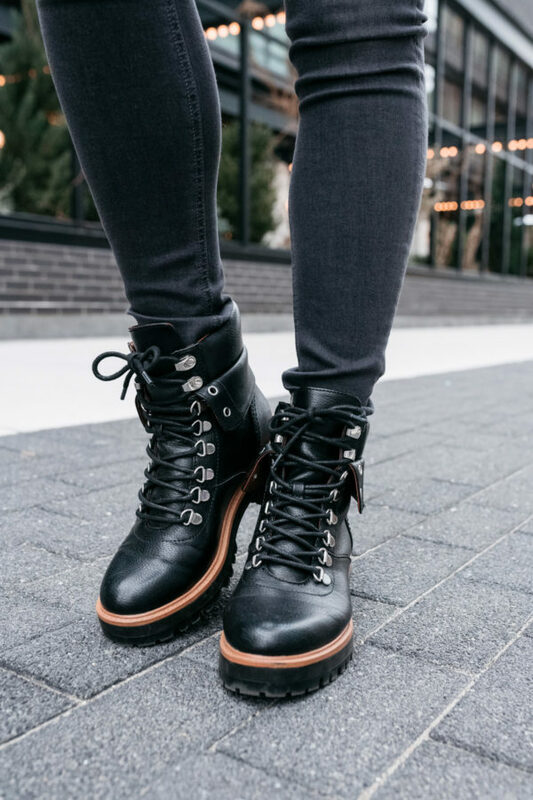 A few people asked me if these lace-up hiker boots were “good for all of the snow we get in Chicago.” Let’s just be clear — these are not snow boots. They are not fleece-lined and they are not waterproof. They are warm, and I usually wear mine with thicker socks because my feet are always cold, but they are not true snow boots. HOWEVER! With that being said, I’m not a big snow boot person. If it’s actively snowing or there are a few inches of fresh snow on the ground, I’ll slip on my snow boots. But in all reality, I live in downtown Chicago and the sidewalks get shoveled pretty regularly. I’m not ever really trekking though the elements, you know? So when it’s slushy outside, raining, snowing, or the sidewalks are just covered in salt (instant shoe ruiner), and I don’t want to wear snow boots, my shoe options tend to be limited because I’m not about to ruin any of my more expensive shoes! ENTER THESE BOOTS. I always try to have at least one pair of cute shoes that I don’t mind wearing in inclement weather! Fashion and function. It’s so nice to throw these on and not worry about what I have to walk through! Sure, I’d be sad if I ruined these because I like them a lot, but buying another pair wouldn’t put me out very much, you know? And with that, I will say that these have cleaned up very well! They were covered in salt, snow, and sand last week and I simply wiped them off with a damp cloth and they looked good as new. Since they are not real leather, they’re much easier to care for! A few more questions I’ve gotten… Yes, they are comfortable. No, they haven’t taken any time to break in — no blisters or pain or anything of the sort. And yes, I find them to be true to size! I’m usually an 8.5 and I got my regular size and can still comfortably wear them with thick socks. Your boots are perfect, they are definitely a thing! Got them after your ski trip post. Love them!